By supporting students through the Changing Lives, Building Community Scholarship Endowment, you not only make a difference in their lives, but also the lives of all those they will go on to impact. This is a great way to make your mark on your community and beyond. 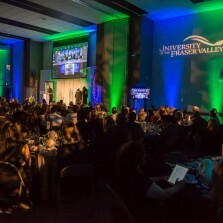 Every day, UFV graduates are actively making a difference in our local communities through healthcare, education, business, and more. And around the world, they putting their skills and passion to work to help people in need. When you support students through this endowment, you become a part of all the good they do for others. Your gift to students through the Changing Lives, Building Community Scholarship Endowment will be awarded to students based on financial need. For a student who could not attend without support, your generosity could change the course of his or her entire life. Do you know someone who's making a difference in the world?